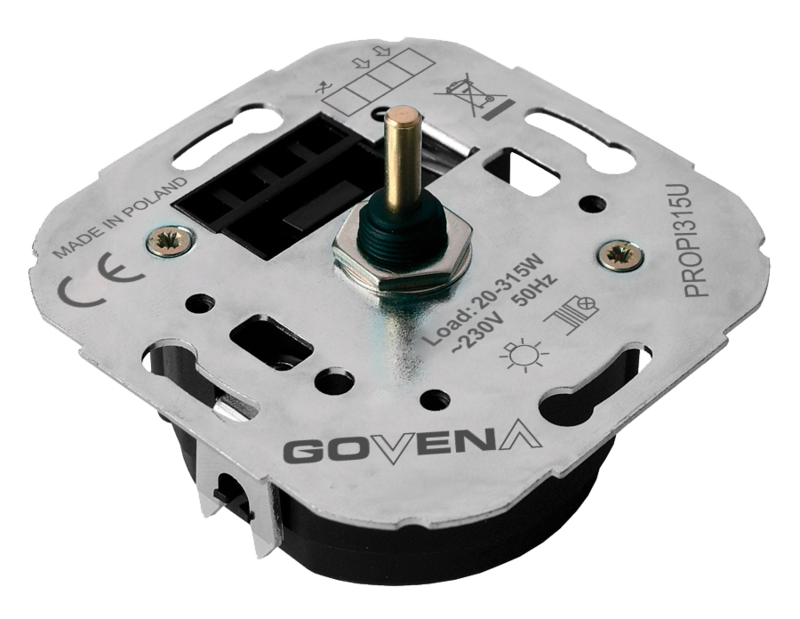 With a potentiometer – Govena Lighting S.A.
product, the so-called “Metal Line”. Operability in a two-way switch system. Type of load Conventional incandescent, 230V halogen, low-voltage halogen with toroidal transformer, compact fluorescent lamps CFL DIMM 15W/20W. Conventional incandescent, 230V halogen, low-voltage halogen with electronic, toroidal or conventional EI transformer, compact fluorescent lamps DIMM 15W/20W. Conventional incandescent, 230V halogen and low-voltage halogen with an electronic or toroidal transformer, compact fluorescent lamps DIMM 15W/20W. Safety Short-circuit protection Yes, by means of a conventional fuse. Yes, by means of a conventional fuse. Yes, returnable. Overvoltage protection No No Yes, microprocessor-controlled, returnable. Thermal protection Yes, after the inside elements of the casing exceed 125°C, the dimmer is switched off, and this protection is returnable. Yes, microprocessor-controlled, returnable. Overload protections No Yes, microprocessor-controlled, returnable. Additional protection None An operating dimmer checks if the executive element (TRIAC) is switched on in each half of the sinusoid. A triple failure to switch the executive element on in any half of the sinusoid causes the activation and locking of the dimmer until it is switched on again. This prevents the component from becoming constant when there is load from a toroidal or a conventional EI transformer, and thus protects the transformer against damage.